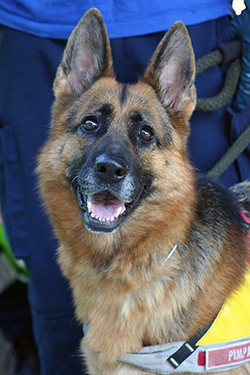 Scooner is a six year old veteran of the Canine Compound Search and Rescue team. With over 13 events to date, nine separate awards and even the key to our very own city, Scooner has won the hearts of many. In fact, many of the lives that Scooner has touched enjoy paying him a visit from time to time and it almost seems as if he never has forgotten who they were.